Line 6 - service suspended until further notice! With 1 million inhabitants (about 3 million in the metropolitan area), Naples is Italy's third largest city and the centre, both touristic and industrial, of southern Italy. 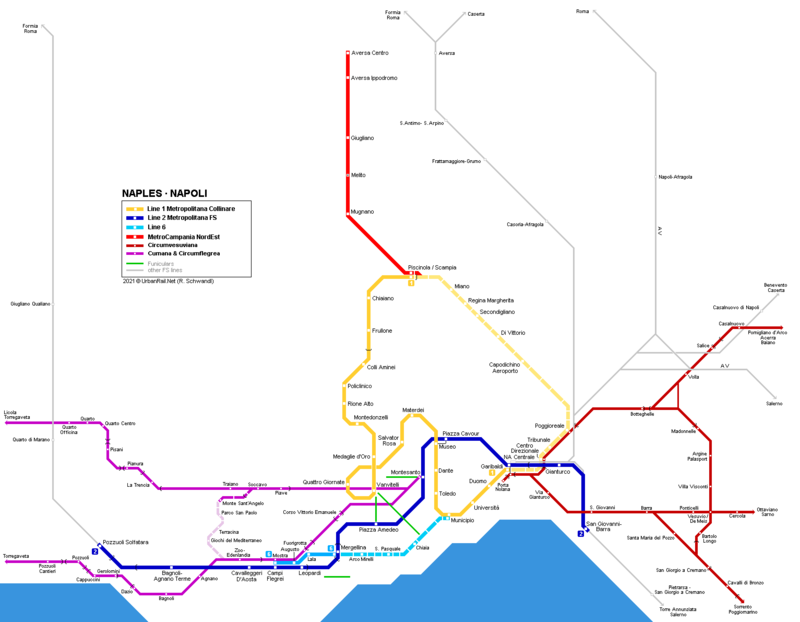 The Naples metropolitan area boasts a large variety of urban and suburban railways, all integrated into the Uniconapoli/Unicocampania fare system. Naples' first metro line, the so called METROPOLITANA COLLINARE (hill subway), now Line 1, opened in 1993 between Colli Aminei and Vanvitelli, the line was extended to Piscinola in 1995 reaching a length of 8 km (4 km underground between Vanvitelli and Colli Aminei). As can be seen on the map, from Vanvitelli the metro line runs in a loop down towards the city centre through a steep (5.5 %) curved tunnel to reach the Salvator Rosa station via Quattro Giornate. Stations between Garibaldi and Toledo will be at sea level. From Vanvitelli northwards, the line literally winds its way up the mountain to reach its highest point at Policlinico (268 m above sea level at station entrance) and then descend again (mainly on a viaduct) to the terminus at Piscinola (126 m). The Vanvitelli - Museo (Cavour) section has been in service since 5 April 2001. Dante station opened in March 2002, while Materdei station took until 5 July 2003 to be finished. 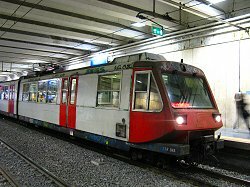 Until 14 Dec 2002, Line 1 operated a 30-minute shuttle between Dante and Vanvitelli. Now the line is in regular service with trains every 6 minutes. From 28 March 2011 until the end of 2013, a single-track shuttle was operated every 15 minutes between Dante and Università stations, not stopping at intermediate stations which were still under construction. Special emphasis was put on artistic design of the stations on the newest section. 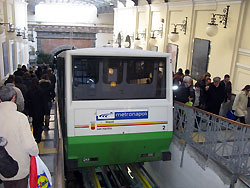 Line 1 is operated by Metronapoli SpA. More Line 1 station photos here! 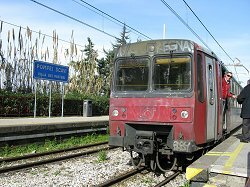 METROPOLITANA FS, now Line 2, is an urban, mainly underground service offered by FS (Ferrovie dello Stato/Trenitalia - Italian National Railways) between Gianturco and Pozzuoli (14.5 km) on the Direttissima Rome-Naples main line opened in 1925. Metropolitan trains run aproximately every 8 minutes sharing tracks with some regional trains. On 14 Dec 2014, the service was extended east from Gianturco to San Giovanni-Barra. Line 6 is a 2.3 km light metro line with four stations. It will be 5.8 km long when it reaches Municipio in 2013. 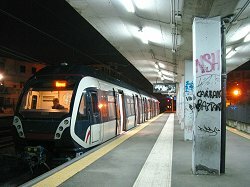 Like line 1, Line 6 is operated by Metronapoli SpA. The construction of Line 6 began in the 1980s to create a Metrotranvia between Mostra in the west and Ponticelli in the east, with underground sections in the city centre and surface routes with level crossings in outer areas. Scheduled to be completed for the 1990 Football World Cup, the line was not opened in time and was later included in an overall transportation programme, now as a light metro. It opened on 04 Feb 2007 from Mergellina to Mostra. Since Dec 2015, service suspended until further notice, possibly until eastern extension to Municipio is ready to open! 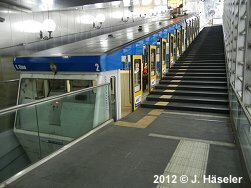 More Line 6 station photos here! 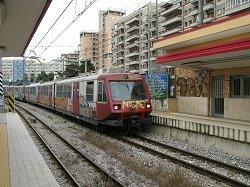 The 'Linea Arcobaleno' (Rainbow Line) is a 10.2 km suburban service, originally operated by MetroCampania NordEst, now part of EAV Campania, on a new underground route, which was opened in 2005 from Piscinola-Scampia to Mugnano, and extended to Aversa Centro in 2009, partly along the old alignment of the Alifana railway, which it replaced; two-car trains (ex-Rome metro A vehicles) run every 15 minutes. Each station is identified by a different colour, hence the nickname of the line. In the future, this line will share the line 1 route between Piscinola and the city centre. The Ferrovia Circumvesuviana narrow-gauge suburban network provides an important suburban service east of Naples around the Vesuvio volcano. The inner sections, once meant to become lines 3 and 4 in the overall masterplan, were upgraded with double track and initially offer a train every 30 minutes. The proposed Line 3 is 12 km long and has 11 stations, 8 of which are underground. The first stretch runs along the line to Baiano, after Botteghelle a 750 m link opened in 2004 towards Madonnelle on the San Giorgio - Casalnuovo line, in service since 2001. Line 3 and 4 cross at Vesuvio/De Meis. 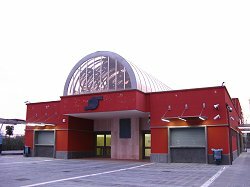 The Circumvesuviana, now part of the EAV Campania network, also provides an important service with trains running every 30 minutes to Sorrento, Poggiomarino via Pompei, Sarno, Baiano and Acerra. The Ferrovia Cumana provides a suburban service along the coast from Montesanto to Torregaveta, with trains every 20 minutes. The urban section is to be upgraded as part of Line 7. The Ferrovia Circumflegrea provides a suburban service from Montesanto to Torregaveta, but further inland than the Cumana, with trains every 20 minutes to Licola. To be upgraded as Line 5 up to Pianura and doubled all the way to Quarto. Both lines, the Cumana and the Circumflegrea are standard gauge and operated by EAV Campania (formerly operated by SEPSA). 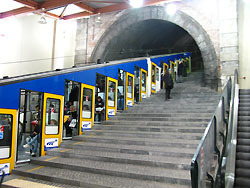 A total of four funiculars operate in the city of Naples, all of them an important part of the city's transport system. Three of them link different parts of the city centre to the Vomero district, which lies some 200 m above the old town: 1) Funicolare di Montesanto; 2) Funicolare Centrale; 3) Funicolare di Chiaia. 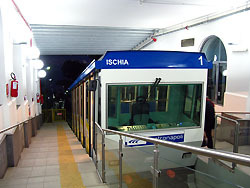 The Funicolare di Mergellina runs from the Mergellina port area to the Posillipo hill. Line 1 (Metro) will become a ring line via the airport and central station. Line 6 (Metro) is extended from Mergellina to Municipio and will be 5.8 km in 2013; at the western end an extension is planned through the BagnoliFutura redevelopment area to terminate at Porta del Parco. 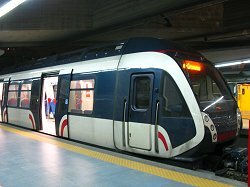 LA METROPOLITANA DI NAPOLI - nuovi spazi per la mobilit� e la cultura.